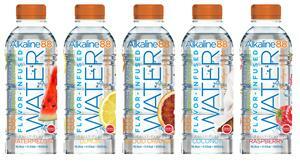 SCOTTSDALE, Ariz., Feb. 06, 2019 (GLOBE NEWSWIRE) -- The Alkaline Water Company Inc. (NASDAQ and TSXV: WTER), a leading producer of premium bottled alkaline drinking water sold under the brand name Alkaline88®, today announced that its first product from the “A88 Infused Beverage Division” is now available for commercial sale, creating a whole new category of Alkaline88® alkaline water. The Company expects roll-outs of additional products to continue over the next several weeks, that will include sparkling flavored hemp infused alkaline water in a 12-oz sleeve can, hemp infused flavored Alkaline88® original, and vitamin infused Alkaline88® original. Management is showcasing the new A88 Infused Beverage Division product line at two important trade shows: Convenience EPPS and the KeHE Summer show. This news release contains "forward-looking statements." Statements in this news release that are not purely historical are forward-looking statements and include any statements regarding beliefs, plans, expectations or intentions regarding the future. Such forward-looking statements include, among other things, the following: that the Company expects roll-outs of additional flavors to continue over the next several weeks; that Nevada-based Western Group Packing (WGP) will begin producing the Company’s flavored Alkaline88 water products at its state-of-the art 150,000+ square feet facility; that the Company is confident that people will love the new flavors; that introducing the new product line at these events will enable leading retailers in a variety of distribution channels to sample these exciting new flavors first-hand; and that the debut of the Company’s A88 Infused Beverage Division is just another example of the Company’s commitment to delivering strong growth that the Company expects will yield continued value for its shareholders.